A sketch of the operations of His Majesty's fleet and army : under the command of Vice Admiral the Rt. Hble. Lord Viscount Howe and Genl. Sr. Wm. Howe, K.B., in 1776. 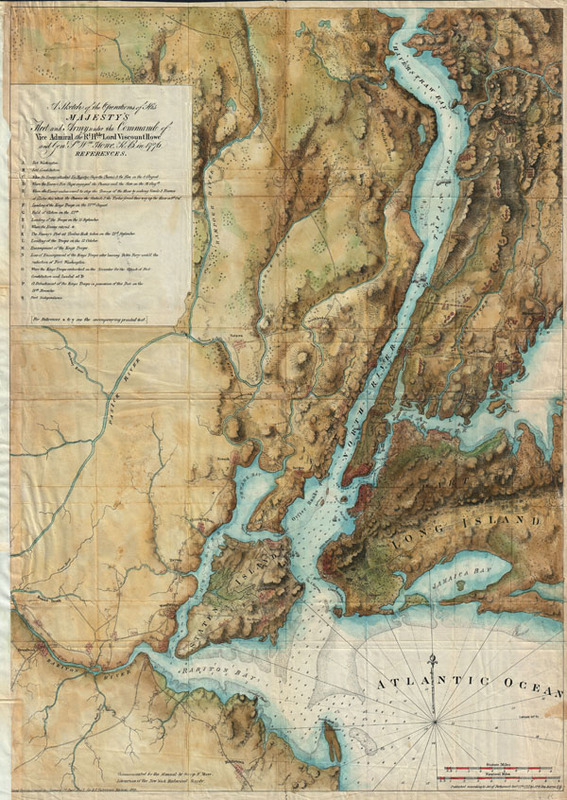 A rare and stunning reissue of the Des Barres famous 1777 Map of New York City and Harbor prepared for the 1864 issue of Valentine's Manual of New York. Covers from Sandy Hook northward as far as Haverstraw and the Croton River. Includes Staten Island, all of Manhattan, much of northeastern New Jersey, and Long Island as far east as Jamaica. This stunning map was originally drawn by Joseph Des Barres to illustrate British troop movements during the American Revolutionary War. Wonderful topographic detail of the entire region with depth soundings through the harbor. With the original Des Barres map all but unobtainable, this is a rare opportunity to acquire a 19th century example of this spectacular map. Joseph Frederick Wallet Des Barres (November 22, 1721 - October 24. 1824) was born in Switzerland in 1721. He is known to have attended the University of Basel where he tutored under the great mathematician Daniel Bernoulli. Following his studies in Basel, Des Barres immigrated to Great Britain where he continued his education at the Royal Military College of Woolwich. Sometime in the 1850s Des Barres joined the American Regiment of the Royal Army in the capacity of Military Engineer. He was assigned to the team surveying the St. Lawrence River where he worked with the legendary cartographer Samuel Holland as well as the young James Cook. Afterwards Des Barres went on to survey and map the Maritime Provinces of New Brunswick, Nova Scotia, and Newfoundland. Des Barres work is known for its stunning combination of accuracy and aesthetic appeal. Augustyn, in Manhattan in Maps writes that with Des Barres, "nautical charting took an unprecedented leap toward greater precision and graphic sophistication". Upon his return to England in 1774, Des Barres was assigned to compile all of the most current cartographic information on the New World into the seminal Atlantic Neptune, which has been described as the "most splendid collection of charts, plates and views ever published" (National Maritime Museum Catalogue). Des Barres would eventually return to Canada where he lived another forty years as a wealthy land owner and active political figure. He died at the ripe old age of 103, one of the few centenarians of the early 19th century. Very good condition. Original folds. Minor restoration and verso repairs. Margin added, left side. New York Public Library, Map Div. 00-466 (1777 edition). Library of Congress, Map Division G3801.S3 1777 .D4 Vault (1777 edition). LC Maps of North America, 1750-1789, 1057 (1877 edition). Haskell, Daniel C. Manhattan Maps, A Co-operative List , 488.